The Compassionate Care Program was developed to respond to the needs of patients and their families in crisis. Many families in El Paso struggle to meet basic everyday needs. Injury or illness can intensify their needs due to medical expenses and limited resources. Crime Victim Services as well as Social Workers at UMC identify patients and families in need and send a request of items in the hope that we can provide assistance during their difficult time. Suggested donated items include clothing, food, transportation assistance, school supplies and toiletries. Organizing donation drives to prepare for the need of highly requested items such as toiletries, school supplies, blankets and food. Package donated items for the families. Assist with delivery of requested items to families as needed. Donors make a difference in the Compassionate Care Program. 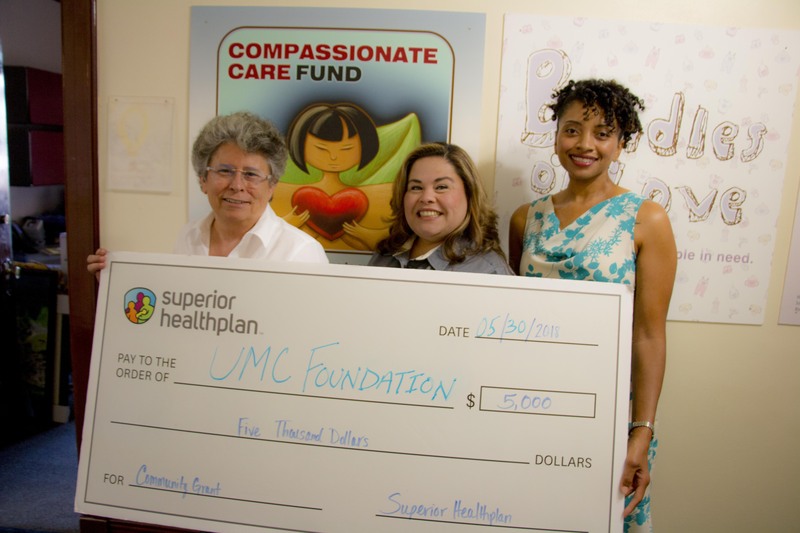 Thank you to Superior HealthPlan for a grant for $5,000 that will strengthen the Compassionate Care Program. Shown from left to right is: Teresa McGlone, Foundation Grants & Development; Monica Barquin, Superior HealthPlan Provider Account Manager for Region 2 Provider Relations, and Carolyn Williams, Foundation Volunteer Corps Program Manager. If you, your family, company or your organization would like to donate to Compassionate Care, contact Carolyn Williams, Volunteer Corps Program Manager at 915/521-7229, Ext. 80528 or cwilliams@umcelpaso.org or click here now to donate.